I enjoy eating Thai food, but when it’s just rif and myself, we don’t get to order much. I was recently at My Elephant with a group of friends, so I got to sample more of their specialties. We started off with some Tod Man Plah (fishcakes) at RM6.80 for 5-pieces. The fish cakes were springy with a hint of kaffir lime. Served with sweet chilli sauce, I found this a tad greasy. 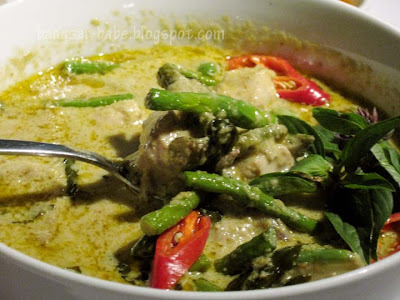 I almost always order the Gaeng Keow Wan (Green Curry Chicken) when I dine in a Thai restaurant. My Elephant’s version was aromatic and tasty. This creamy curry had just the right balance of spices, and the chicken pieces were fresh and tender. 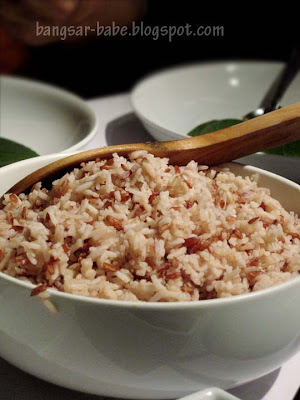 Instead of white rice, we had Jasmine rice mixed with brown rice. It costs RM2.50 per person, with unlimited refill. I didn’t eat the rice so I don’t know how good it was. 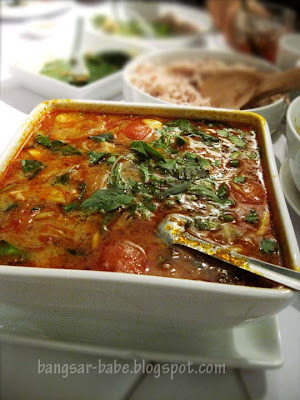 If you have a penchant for spicy and sour food, try their seafood Tom Yam. The tom yam came with decent-sized prawns, squid, tomatoes and mushrooms. It was spicy, sour and very fragrant. However, if you can’t take too spicy soup, it’s best to eat this sparingly. Joe took a few sips, and his face turned red almost immediately! 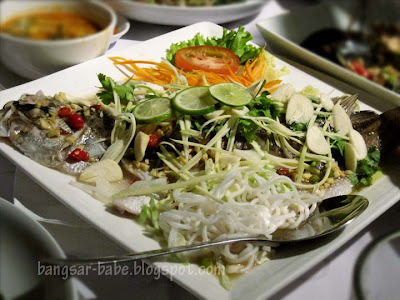 Plah Nung Manow is Thai-style steamed siakap fish in lime, garlic and chili padi. 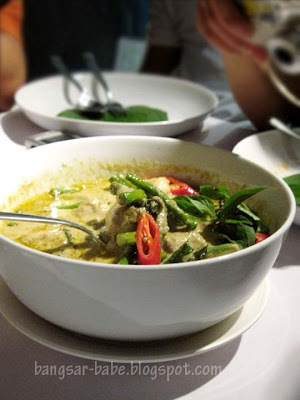 The light gravy was sour and slightly spicy from the combination of lemongrass, chilli, lime and fish sauce. I thought the fish tasted slightly muddy, so I didn’t quite like it. 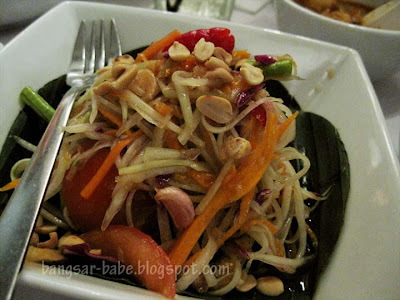 If I’m not mistaken, this is the Yam Mamuang Talay (Green Mango Salad). It was sour, spicy and tangy, but not till the extent of making your face pucker. 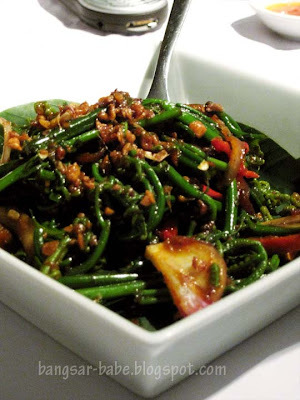 The jungle vegetable of the day was stir-fried paku pakis (fern leaf) with chilli belacan. A bit oily, but it tasted decent. 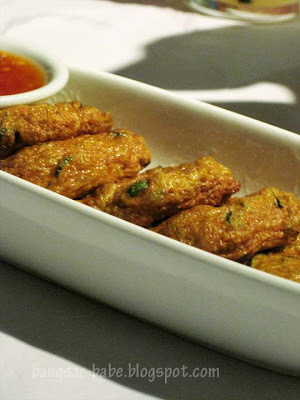 I liked that they used young paku shoots – it had a nice, crunchy texture. 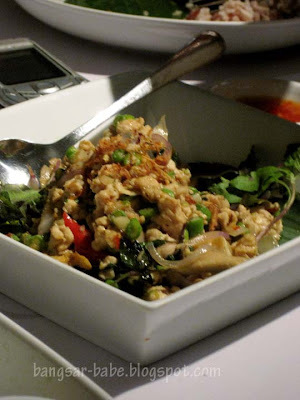 Gai Phad Grapow (Thai chicken with basil) is one of Thailand’s traditional delicacies. The minced chicken was slightly spicy and fragrant from the Thai basil. Simple yet tasty, I enjoyed this a lot. 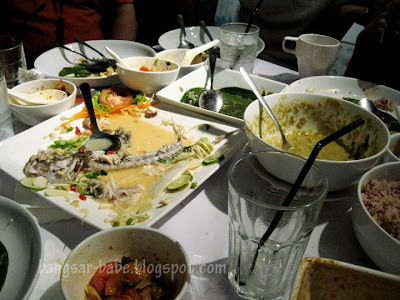 I’m not sure how much dinner cost, but we paid about RM34 per person. I wouldn’t mind coming here again, only if I get a group of 6 or more! The place is quite small, so it is very noisy when it’s a full house. This is not the place you go to for chit chats. Verdict: I found the food decent in general. Price wise, it’s reasonable if you were to dine in a bigger group. i came back on a friday around 7pm..best guess for a quiet dinner is 6pm..bcos by 8pm..it was the same bustling scene like that nite when we dined there.. It's always nice to dine in with a group of people so you can order lots of different food! Spicy tomyam really spicy? I wanna try that out! And the mango salad too, looks good! there's something very homely, comforting and tasty bout chicken with basil, right? wonder why no other cuisines use them as liberally. basil leave with chicken is my all time fav….superb with rice!! Ooh lovely, I really like how they serve brown rice! Much preferred to plain white rice, which I find so boring, unless it's banana leaf! The aftermath of the meal looks like a sealed deal… sighs of contentment all around for sure!! 550ml – Yes, I think they all enjoyed the food! Sugar Bean – Quite spicy. Some find it too spicy, but I like it that way! Joe – So the trick is to come before the dinner crowd. Thanks! leo – Why not yet explore? Your wife cannot take spicy food ar? Like this place very much. Section 17 is such a bizarre place.. So many good higher end restaurants in an old suburban neighbourhood. So cool. ..